FILE – Ivory that forms part of a two ton discovery by Togo troops is seen in the city of Lome, Togo, Jan. 28, 2014. 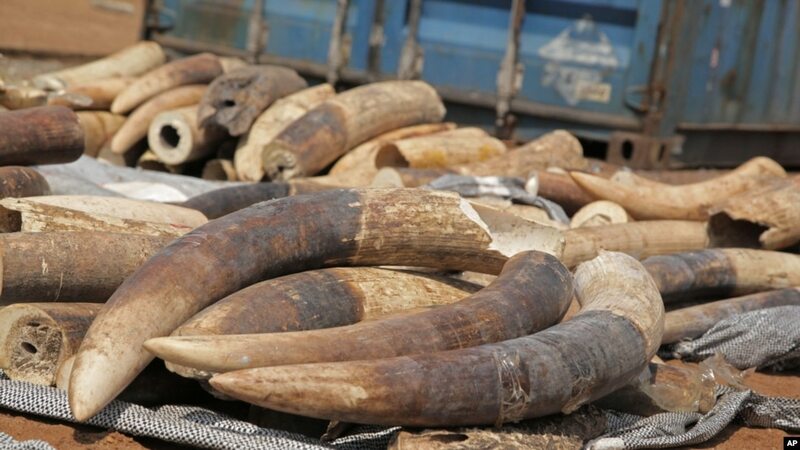 Police in Togo say they have arrested three men after discovering nearly two tons of ivory in a container marked for shipping to Vietnam. Conservation group Save the Elephants says Vietnam is one of the world’s biggest illegal ivory markets, becoming popular among Chinese buyers. The group says in the past eight years the number of ivory items for sale has increased more than six times. Save the Elephants researcher Esmond Martin said 60 percent of the ivory tusks sold in Vietnam were from African ports located in the Indian Ocean. 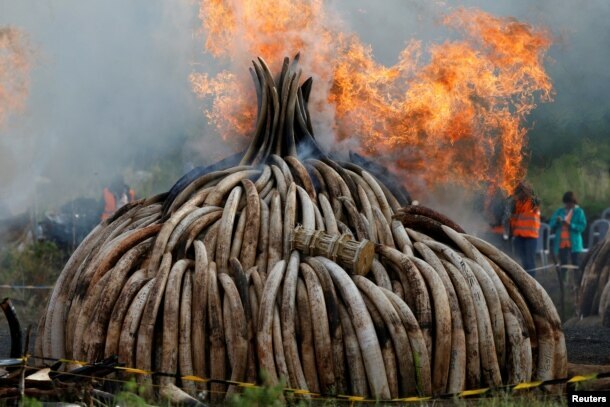 Fire burns part of an estimated 105 tons of ivory and a ton of rhino horn confiscated from smugglers and poachers at the Nairobi National Park near Nairobi, Kenya, April 30, 2016. The group’s report “Vietnam’s Illicit Ivory Trade” documented more than 16,000 ivory items on display ready for sale in three towns and its surroundings. In a similar report in 2008, 2,400 items were on display in the same locality. The investigators noted lack of law enforcement and corruption contributed to the expansion of the ivory trade in Vietnam. They also found an increase in Asian tourists has driven up demand. Over the past couple of years, the Chinese government has clamped down on the illegal elephant ivory trade, in turn, Chinese ivory buyers have crossed the border into Vietnam stated researcher Lucy Vigne. The Save the Elephants report says 75 percent of the ivory buyers in Vietnam come from China. 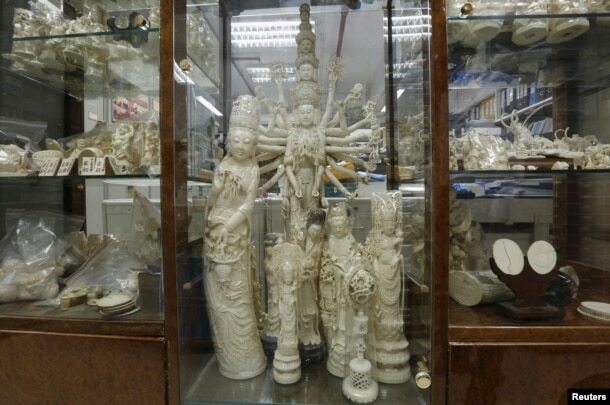 FILE – Products from elephant ivory are displayed on the centre column of a shelf inside a carving and jewellery factory in Hong Kong, Oct. 23, 2015. Craftsmen in Vietnam earn an average of $260 a month. In China, an artist makes at least $800. The founder and the head of Save the Elephants, Iain Douglas-Hamilton, stressed the need to close new markets emerging in Asia. “The study is a warning that when you think you are on the verge of solving a problem, it may shift across to the borders of other states … in this case, the problem now of illegal ivory trading has shifted across the border with Vietnam … so really the only hope is to bring down that demand and bring down the desire for ivory, and this has been widely recognized by China and America,” Hamilton said. In the past couple of years, the price of ivory, especially in China, has tripled to $2,000 per kilogram. It is estimated that 100,000 African elephants were killed between 2010 and 2012. Isaac Mutisya stands next to a grave, a simple cement slab shaded by a gum tree on the family farm in Kitui, eastern Kenya. “This is where I buried my daughter; the one who always brought happiness and joy to this family,” said the soft-spoken high school maths teacher. Risper Mutisya died a year ago almost to the day. She was one of 142 students killed when the Somali militant group al-Shabab stormed Garissa University College in northeastern Kenya on 2 April. The attack and subsequent siege lasted more than 10 hours. Risper, aged 24, managed to survive the initial gun and grenade assault that began in the early morning. But then the militants, believed to be five heavily armed men, started hunting for the students who were hiding. Helen Titus, a third-year student of education, had taken shelter in the same dorm room as Risper and a group of other young women. But there were bars on the windows, no fire escape, and they were trapped. Titus remembers in those terrifying moments the militants assured them that Islam did not permit the killing of women. Instead, “they separated the boys from us and started killing the boys.” News reports said they had focused on executing Christians. But that didn’t happen. After warning everyone not to move, “they went up to other rooms and killed more students. One hour later, they came back for us”. The gunmen opened fire. Titus kept her face down and played dead. Although nicked by a bullet, it was a flesh wound, and she remained motionless. The Kenyan government has been widely condemned for its response to the attack. The elite anti-terror RECCE police unit was mobilised, but there was seemingly no helicopter available to fly them the 380 kilometers to Garissa, which borders Somalia. They were forced to go by road, a journey of seven hours. There was confusion over the coordination of the security forces at the scene. Worse still, the attack may well have been prevented: credible intelligence reports warning of an impending raid on universities had been ignored. Risper was a bright second-year business management student. Titus, who had shared a room with her for a year, said she was “very serious with her studies” and had talked about specialising in accounting. “I had so much hope in her,” said Isaac, a successful farmer with a solid home and respectable land holding. Risper was the Mutisyas’ second-to-last born, and was adored. The loss of a child is bad enough, but what happened next magnified the family’s grief. Risper’s body was airlifted to Nairobi, but then disappeared. She should have been kept at Chiromo Mortuary, a University of Nairobi-owned facility, along with the remains of the other students. But the Mutisiyas could not trace her. Isaac made several trips to the mortuary – checking and re-checking the gradually decomposing bodies. As the number of unclaimed corpses fell, to three, then two, he began to hope that, somehow, maybe, Risper was still alive. One student had emerged from hiding five days after the attack, why not Risper? The DNA test on the last remaining cadaver was negative – had the authorities made a mistake in reporting her as dead? The unknowing continued for six months. Isaac shuttled from government office to government office, going back to his family to report each time that there was no news. But then, finally, realisation dawned. Risper’s second name – Kasyoka – was the surname of a young woman who had already been buried. A DNA test was organised for the parents and it was a match for the unclaimed corpse in the morgue. There had been a tragic mix-up over the name and fingerprints of the two students. A second DNA test on the disinterred body confirmed it was Risper. The gunmen were all killed at Garissa. But, a year later, five additional suspects have been charged in connection with the raid – including a Tanzanian national discovered hiding within the campus, and a university security guard found taking photographs on his phone of the carnage. The suspects deny any involvement, and the trial is continuing. The university re-opened in December, and there will be a fresh intake of students at the start of the new academic year in September 2016. The government hopes that the worst is over. But there has been no public inquiry over what went wrong, which has not helped public confidence. Kenyan students don’t appear to feel any safer. Ten days after Garissa, a student perished in a stampede at Nairobi University when a power transformer blew outside the hostels. In November, administrators at Strathmore University in Nairobi failed to announce a mock security drill in advance. The shot fired in the air to begin the simulation triggered mayhem. A staff member died. And then, in March, a disturbance at Kenyatta University in Nairobi led to a stampede, with panicked learners jumping out of third-floor windows. At least 38 people were injured. Although Garissa has re-opened and the attack has, to some extent at least, brought people together, security expert Richard Tuta warned that the policy of the Kenyan government towards Somalia hasn’t changed. Without a settlement in Somalia, “the attacks in northeastern Kenya and in the country won’t stop; they will continue,” he added. Kenyan officials say at least 10 people died and 70 others were wounded Friday in two explosions targeting a minibus and a busy market in the capital city, Nairobi. The attacks came days after the U.S. and British governments issued travel advisories regarding potential terrorist attacks in the country. Mohammed Yusuf reports. Investigators said improvised explosive devises were used to target the attacks. The minibus was spattered with blood, its windows and tires blown out. A second bomb exploded nearby, also near a market best known for second-hand clothing. Nairobi Police Chief Benson Kibui said police, acting on tips from the public, had detained a bombing suspect. Security officials said the suspect is a Kenyan national. In a statement Friday, the U.S. embassy in Nairobi warned its citizens to increase their personal security in light of Kenya’s continuing terror threats and violent crime. “Terrorist acts can include suicide operations, bombings – to include car bombings – kidnappings, attacks on civil aviation, and attacks on maritime vessels in or near Kenyan ports,” the statement read in part. The blasts came a day after 300 British tourists were evacuated from the coastal city of Mombasa, following a travel advisory issued by the British Foreign Office. Kenyan President Uhuru Kenyatta said evacuations only help the terrorists. Such action “only strengthens the will of terrorists as opposed to helping us defeat that war,” Kenyatta said. The Mombasa County executive in charge of tourism, Joab Tumbo, lamented the impact of the bombings and advisories. One immediate commercial victim of Friday’s bombings was a regional telecom conference, East African Com, scheduled to take place in Nairobi next week and to attract top industry executives. Organizers said they canceled it because of security concerns. Past attacks in the east African nation have been widely blamed on the Somali Islamist militant group al Shabaab, which wants Kenyan troops out of Somalia. In September, gunmen from the group killed 67 people in a raid on a Nairobi shopping mall. Many of the attacks have been along Kenya’s Indian Ocean coast, including the port of Mombasa, a tourist favorite. Some others have been in Nairobi, mainly near the Somali-populated Eastleigh district. Friday’s blasts were close to Eastleigh. Tourism already had been damaged by kidnappings by Somali pirates in the north near the Somali border, though that threat has subsided over the past 18 months. A government crackdown on Muslim militants may be having unintended consequences for some Christian churches in Kenya. For the past two years a Salvation Army Church has been the target of attacks by young Muslim men, angry at what they consider a harsh police crackdown on potential militants. Mohammed Yusuf reports. The Salvation Army church has stood in Majengo neighborhood of Mombasa since late 1920’s. In recent years the church has been attacked by Muslim youths who have fought with police to protest the deaths of clerics and young men in the government’s crack down on al-Shabab militants. Damage is still visible from an attack last October, when attackers threw gasoline bombs at the church, burning down its training hall and a store. Six months later, security concerns mean at least two police officers are assigned to protect more than 100 worshipers every Sunday. Despite the threats, fifty-one-year-old Mary Ivusa still comes to the church, but worries about possible new attacks. “Fear, fear is too much in our lives because as mothers we come with little children who cannot run, they are still very young, so its fear which is in our lives. And that’s what has made us fearful when there is no enough security,” she said. In April, two gunmen stormed a church in Mombasa’s Likoni neighborhood and opened fire, killing four worshippers and injuring 15 others. Ivusa, a mother of three, said that attack made many people too afraid to come to church. “For me I have never missed, but they are so many women who don’t come because they are afraid. They don’t know what will happen next, especially when you see that one which happened in Likoni, it has brought more fear so many mothers have not come,” she said. Since that attack the government has provided security for churches, especially in coastal towns. John Muliro, a retired church elder, said church officials had to sacrifice some things to avoid confrontation with youths who might be disturbed by their presence. “We might say we have changed, like we usually have what we call outdoor meeting whereby we go out to evangelize and sing as we march on the road, we don’t do that. But otherwise we are able to move on and do our best,” he said. Regional security analysts said some Muslim youths directed their anger at churches because of the disappearances and killings of Muslim clerics and youths accused of having links to terror group al-Shabab in Somalia. Local human rights organizations accuse the Kenyan police of using heavy-handed tactics against the Muslim community, including forced disappearances and murder. Police deny the accusations and say they are defending the nation from attack. Sergent Major Alfred Charles Mugo, an elder at the Salvation Army Church in Mombasa, said Christianity has not wronged the Muslim youths and they should use the right channel to express their grievances. “There is rule of law in this country. We are not living as animals in this nation, we have a law if someone has wronged you just go and exercise the law take them to court. You cannot just wake up and start attacking other people as if they are the one who have wronged you,” he said. For now, at the Salvation Army Church, members of the congregation hope it can stand firm despite the turbulence. Late Sunday, Mohammed Salim Aliyan, an alleged informer to Kenyan government officials, was killed by unknown gunmen as he was about to enter his house in the coastal Kenyan town of Malindi. As Mohammed Yusuf reports for VOA from the town of Malindi, another battle looms as local terror cells fight to suppress the information provided to authorities. As the region’s third purported informant to be murdered since December, Aliyan’s shooting has further shaken coastal communities affected by an ongoing battle between Kenyan forces and al Shabab militants who claimed responsibility for last year’s assault on Nairobi’s Westgate shopping mall, which left 67 people dead. Sunday’s killing has also put pressure on Malindi police officials to step up the investigation. The words were hardly reassuring in the wake of other violent killings carried out by suspected al Shabab militants. Faiz Mohamed Bwarusi, a madrassa tutor and father of two, was found beheaded on December 4. In late January, Ahmed Bakhshwein, who has been described as a top Kenyan spy who routinely fed counterterror information to officials in Nairobi and Washington, was shot dead in the streets of Malindi by gunmen on motorcycle. African news outlets have described both Bakhshwein and Aliyan as “police reservists” who purportedly monitored youth radicalization activities on behalf of government authorities. According to “James,” a Malindi resident who chose to withhold his identity for fear of retribution, the three victims all knew each other. Claiming to have known Bakhshwein for more than 25 years, James said he met Aliyan and Faiz after they joined Bakhshwein in gathering information about terrorist activities in the area. Faiz, James said, knew youths who were recruited into the ranks of al-Shabab and their activities in the coastal region. In an interview with VOA, Faiz’s elder brother Musao Mohamed said his family did not suspect Faiz of involvement with government authorities. However, multiple sources tell VOA that Faiz’s occasional work ferrying goods — and sometimes youths — between Somalia and Kenya that led Bakhshwein to seek him out as an possible informant. “The informers found out Faiz knew bad people and had lots of experience being around them, but [they] did not know he was not one of them,” said James. Regardless of whether Faiz was involved with radicalizing youth on behalf of al Shabab, James fears that the militant’s will likely continue targeting anyone suspected of informing Kenyan authorities. That, he says, will be a big blow in the fight against terrorism unless authorities take measures to protect such people. The radical Kenyan cleric Sheikh Abubakar Shariff, also known as Makaburi, was killed by unknown gunmen Tuesday evening outside Mombasa’s Shanzu Law Courts. Accused by U.S. and U.N. officials of supporting Somalia-based al-Shabab militants, Makaburi was connected with Mombasa’s controversial Masjid Musa Mosque, where Kenyan security forces recently carried out a series of deadly raids, leaving the city’s Muslim community shaken. News reports indicate Mombasa’s top police officer Robert Kitur recently defended the raids, telling Justice Edward Mureithi of Mombasa’s High Court that the facility was stormed only after “intelligence that some extremists were there radicalizing youth,” and that the situation posed a threat to national security. Makaburi’s killing comes just days after he publicly expressed support for al Shabaab and the group’s 2013 Westgate Shopping Mall terror attack in Nairobi. What follows are key excerpts from a 2013 VOA interview in which Makaburi talks about another slain cleric Sheikh Aboud Rogo and also predicts his own death. Yusuf: You are accused of being an al-Shabab supporter and also the group’s recruiter in Mombasa. Makaburi: I have never seen a recruitment booth in Mombasa or any specific place where a youth can go and be recruited. That is a lie. What is being done in Mombasa is [that] people are taught their religion and, in Islam, we do not have borders. Yusuf: Why do you think some youths are joining al-Shabab? Makaburi: Its oppression. We Muslims know that we are getting killed. Our government is killing us. … Now, when you get killed, there is nowhere to go for help, like the case against Sheikh Aboud Rogo: a year has passed [since his 2012 killing] and… nothing. Nothing will be gotten from the government. No justice. That’s what make the youth angry. Yusuf: Police have repeatedly said people are not coming forward to give information that can lead to the arrests of the gunmen or killers of your friends. Makaburi: Who will come out to tell the police that you killed (sic)? They are afraid for their lives. If they are true to their word, [the people] are accusing the police of killing Muslims in Mombasa; if [the police] are true to their words, there should be a non-partial investigation. They should not be involved in that investigation. How can a killer investigate himself? Yusuf: Some of your friends, like Aboud Rogo, have been killed. What has life been like without your friends around you? Makaburi: Very lonely. All my friends are dead. I know the killers. I cannot do anything about it. I cannot get justice for my friends’ killers. It’s very lonely. Yusuf: Do you fear for your life? Yusuf: Do you think you will be done with these terror cases in court whether you are found guilty or not? Makaburi: I don’t think I will finish the case. They will kill me before that. Yusuf: And why is that? Makaburi: Because I believe in Islam and am ready to die for it. And because I will not keep quiet and let my religion being stomped upon. Yusuf: Where is your family? It looks like there is no one here except you? Makaburi: My family cannot stay with me. They are afraid they will be killed. I am staying by myself. Yusuf: How often do you see your family? Makaburi: I see them regularly but they cannot stay with me. Nobody from my family comes and visits me, because they do not know at what time the government squad killers will come for me. Yusuf: I understand you have a boy, age nine, how will your son view your death? Makaburi: My son will know that his father was the one who was wronged, because, as you have seen today, I was in court. I am obeying the law. It’s the government which is breaking the law. It’s the government which is killing the people extra-judicially. Each April, Rwanda and some other African counties pay homage to victims of the 1994 genocide. Those countries include Kenya, which has also had its share of political volatility and inter-tribal fighting, especially after the 2007 presidential election. Mohammed Yusuf reports. Kenyans have since made progress building credible government institutions, and the international community has pushed Nairobi’s leaders to implement political, security and judicial reforms in order to avoid a return to violence, but some analysts say those gains are fragile. According to political analyst Adam Oloo, a lecturer at the University of Nairobi, Kenya must learn how to let institutions work without interference. In 2010, more than 60 percent of voters approved the new document, which created a Supreme Court and set new procedures for appointing top government officials, police and judges, thereby replacing the old constitution that many saw as a root cause of institutional weaknesses that enabled violence. Late in 2012, a survey showed more than 80 percent of Kenyans had confidence in the courts. This confidence prompted the losing presidential candidate in that year’s election, former prime minister Raila Odinga, to challenge the result in the Supreme Court, rather than calling for mass protests. John Githongo, head of Inuka, or Stand Up Kenya, says some politicians are fighting recent changes. He warns that recent gains for democracy and rule of law could be erased. Githongo says the constitution is the primary instrument for holding his countrymen together in a peaceful future. President Uhuru Kenyatta and deputy William Ruto are facing charges at the International Criminal Court they helped to orchestrate the post-election violence, but the case against Kenyatta is on the verge of collapsing. A former anti-corruption campaigner, Githongo notes the president and Ruto formed their alliance in part to fight the ICC, and suggests things may change if the Kenyatta case is dropped. But Githongo doubts that will happen. He says the nature of Kenyan politics is that change is usually accompanied by some sort of violence.